City residents will have the use of free litter dumpsters for the disposal of neighborhood litter and outdoor residential yard wastes. 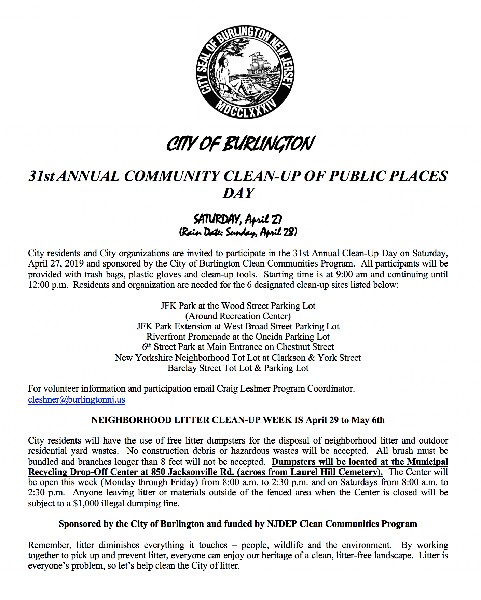 No construction debris or hazardous wastes will be accepted. All brush must be bundled and branches longer than 8 feet will not be accepted. Dumpsters will be located at the Municipal Recycling Drop-Off Center at 850 Jacksonville Rd. (across from Laurel Hill Cemetery). The Center will be open this week (Monday through Friday) from 8:00 a.m. to 2:30 p.m. and on Saturdays from 8:00 a.m. to 2:30 p.m. Anyone leaving litter or materials outside of the fenced area when the Center is closed will be subject to a $1,000 illegal dumping fine. Remember, litter diminishes everything it touches – people, wildlife and the environment. By working together to pick up and prevent litter, everyone can enjoy our heritage of a clean, litter-free landscape. Litter is everyone’s problem, so let’s help clean the City of litter.